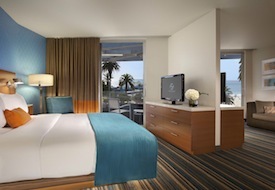 What's Your Santa Monica Hotel Style? Los Angeles is such a sprawling patchwork of neighborhoods – from haute Beverly Hills to shabby-chic Venice Beach – that choosing where to stay during a leisure visit can be a bit perplexing. I like to suggest that couples consider Santa Monica, a beachside community that offers a bit of everything, from eclectic dining (such as The Misfit for a terrific small-plate menu and neighborhood happy hour ambiance) and shopping (along the pedestrian-only Third Street Promenade and in the new Santa Monica Place mall with its rooftop dining deck) to walking/jogging/biking (on the paved beachfront path that runs to neighboring Venice Beach) and even kitschy fun on the world’s only solar-powered Ferris wheel (at Pacific Park atop the historic Santa Monica Pier, shown above at left). Plus, the sunsets from the cliff-top park that spans Ocean Avenue are always spectacular. 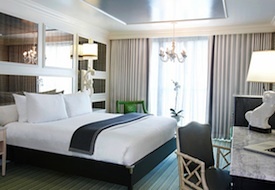 I recently toured four hotels in Santa Monica, each offering a very different style and all worthy of a stay during your next visit. 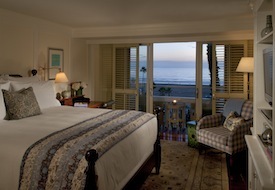 Feet in the Sand: Shutters on the Beach With its residential beach cottage decor, the 198-room Shutters on the Beach sits front and center on the sand, offering both a sunny pool deck with Pacific Ocean views as well as bike rentals, surf lessons, and yoga on the beach. Inside, the living room-like lobby features two fireplaces (a great spot to enjoy a glass of red on nippy coastal nights) with an adjacent small bar. The inviting room decor evokes a beach house feel with soothing white walls accented by pale yellow or subtle blue, four-poster beds, whirlpool tubs, and ocean views. There are two restaurants, both with a great Southern California vibe and beach panoramas: Coast Beach Café & Bar with its open kitchen and communal table and a lively bar, and award-winning One Pico, where Executive Chef Michael Reardon and Master Sommelier Peter Neptune have created seasonal market menus and an exciting yet affordable wine list (plus monthly three-course prix-fixe Love the Grape food-wine pairing menus designed around specific wine regions, for $45 per person). Couples can also check out One The Spa for “As You Like It” Massages and his and her facials, from $425/night. 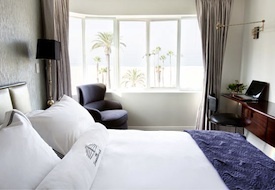 Sustainable Chic: Shore Hotel Santa Monica’s first new build since Shutters opened in 1993, Shore Hotel debuted on Ocean Avenue in October 2011 as the city’s first eco-friendly property (it is awaiting LEED certification, expected shortly). The contemporary boutique hotel features a spare, glass-walled lobby and 164 rooms and suites, 100 of which have full or partial ocean views, and all of which feature low VOC materials, low-flow water fixtures, and wood from sustainable forests. Decor (shown at left in an Ocean View One-Bedroom Suite) is sleek yet vibrant with blue wall accents, pale green chairs, and tangerine pillows atop a striking contemporary carpet. Small balconies overlook the pool and the city’s palm-tree-lined park (not to mention the famous sunsets), while double-paned windows keep out noise and a glass-walled bathroom (with privacy shade) gives the 320-square-foot rooms an airy, open feel. Rounding out the amenities are a solar-heated pool with Jacuzzi and a Blue Plate Taco restaurant, set to open by June and offering delicious flavor combos such as a lobster truffle taco. The concierge is also able to arrange everything from hybrid car rentals or taxis to the location of the top organic coffee shops, from $250/night. Retro-Romance: The Hotel Shangri-La Couples seeking the retro Art Deco glamour of old Hollywood should reserve at The Hotel Shangri-La, a 71-room, circa-1939 architectural stunner on Ocean Avenue that, thanks to a multimillion facelift, still wows with a visually pleasing and timeless elegance – plus Wi-Fi and all the modern necessities. Room decor (shown at right) is sleek yet romantic in shades of silver and gray with eye-catching details (cozy throws, comfy chairs) in deep red, purple, and blue hues, while suites jazz things up with animal hide rugs atop polished herringbone-patterned hardwood floors. A courtyard shelters a cabana-lined (what else?) pool deck and bar, but the chicest vantage point for cocktails, sunset snacks (the popcorn chicken and crispy rice mochi are both addictive) and people-watching is Suite 700, the rooftop penthouse lounge, which offers up a nightly happy hour with panoramic views of the city, the ocean, and the lights of Santa Monica Pier, from $305/night. locals who congregate here. 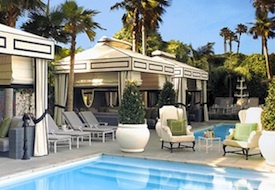 There’s also a stunning cabana-lined pool (shown at right, which you can rent for a private romantic dinner) and Whist, the hotel’s modern Mediterranean restaurant helmed by Executive Chef Tony DiSalvo, from $295/night. See our Los Angeles destination guide for more trip-planning information, then use our Travel Search price comparison tool to find the lowest rate on flights, hotels, packages and more travel deals.